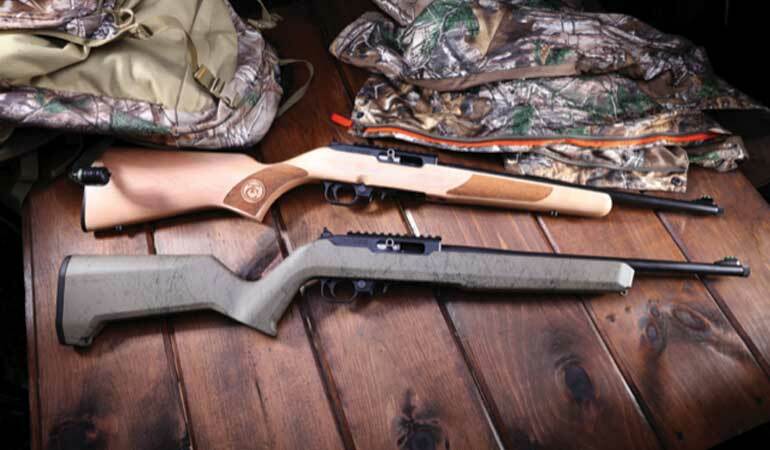 Thompson/Center Arms announced that it added two new rifle stock options to its line of T/CR22 rimfire rifles. Starting in May, the Thompson/Center T/CR22 rifle will be available with a traditional hardwood stock, as well as a Magpul composite stock in a Flat Dark Earth (FDE) Black Grit finish. The T/CR22 rifle, which is available in five different finishes, is designed for hunters, plinkers, and first-time shooters alike and integrates a variety of high-end features into an innovative rimfire package. The new T/CR22 rifles with Traditional Hardwood and FDE Black Grit finishes include a green fiber optic front sight and adjustable rear peep sight for quick target acquisition, while the built-in picatinny-style rail allows for the mounting of an optic for precision shooting at longer ranges. The rifle features a light, crisp trigger pull, button-rifled barrel, and a threaded muzzle that allows for the use of a suppressor or other muzzle device. Chambered in .22LR, the T/CR22 rifles with Traditional Hardwood and FDE Black Grit finishes ship with one 10-round detachable rotary magazine and includes a limited lifetime warranty. These new T/CR22 rifles are priced at an MSRP of $419.